Shortly after watching the scene get filmed, I managed to get some time with The Tick creator Ben Edlund. 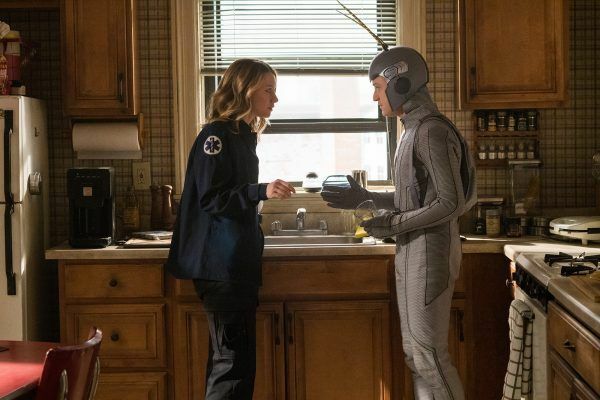 During the interview, Edlund talked about the Season 1 finale, what fans can expect in Season 2, how much the series will focus on The Tick’s backstory, Miss Lint’s storyline now that the Terror is locked up, Arthur embracing being a superhero, some of the new characters introduced in season 2, Dangerboat and Arthur’s blossoming relationship, how the storyline changed during the season, and so much more. Check out what he had to say below. 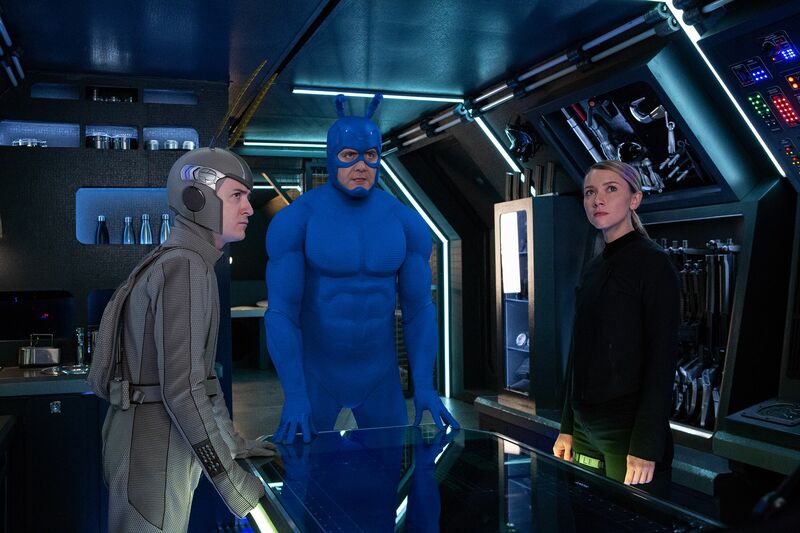 The Tick also stars Peter Serafinowicz, Griffin Newman, Valorie Curry, Brendan Hines, Scott Speiser and Yara Martinez. Collider: Am I wrong, or did The Tick start in the New England Comics newsletter many years ago? I remember it starting there and what is it like having something that you created that long ago finally sort of permeating into the culture now in a way that’s arguably the biggest it’s every been? EDLUND: Weird. Cool. Good. It’s very strange. This is a weird … I’d say if I was on the outside of this, I would be interested in this because it’s a strange phenomenon of one creator repeatedly returning to a thing in a variety of different mediums and sort of being allowed to do that. I don’t know. It’s been sort of a very fortunate kind of cyclical evolution and relationship that The Tick‘s had with an audience that started in a newsletter and then became a comic book audience, and then there’s a variety of people for whom the cartoon is kind of woven into their childhood memories as a Saturday morning cartoon sort of ritual kind of thing, or as a stoner college ritual. And then it’s sort of gone on to live action expressions. And now there’s these waves of different familiarities that we inherit at this point where superhero stuff is as saturated as it’s ever been. It seems, The Tick talks a lot about destiny. This feels like a lot of synchronistic kind of elements paying into this renaissance. I think it’s great. I think it’s cool and quite interesting. Last season ended with … almost every show ends with a little bit of a cliffhanger like, “What could be next?” I believe it ends with, “They’ll be watching you,” something like that. So, my question is when that line gets thrown in at the end of season one, was there any thought to what that could mean in terms of season two? And how much is that just, “We gotta say something at the end to tease what could be”? EDLUND: Right. Actually, the cliffhanger was a lot more conclusive and then we backed away from it because we wanted to not show our hand as much as we had. So, our plans were pretty defined in terms of the second season has a lot to do with AEGIS coming back to town and with the idea of Big Brother watching us or governmental surveillance. The fun one has with a human policing reaction to the superhero phenomenon, and that’s kind of part of what we get to play with in the second season. Forgetting the second season, was it similar to a network situation where you’re going to the Amazon executives and pitching out what the idea would be? And how much is it they’ve seen what you’ve done and they just trust you? In terms of getting the green light. EDLUND: I think that a lot of that was really based on just the reaction that sort of occurred worldwide to The Tick and also Amazon sort of, we’ve always just had I think a really strong kind of relationship there. And my impression is they have an investment in the future of it, so I would guess basically we got a green light and we had already sort of … I’ve talked to Amazon about a long ranging plan, so they kind of understand where we’re going in a lot of ways already as far as like a five year kind of plan has been the notion. We’re on board with, kind of together with the idea of where we’re going. This next season is just the next part of that journey. The first season sort of touches on Tick’s backstory. How much is his backstory playing into the second season and how much is that part of a five year plan? EDLUND: This is the series that wants to play with that and those ideas in a much more aware and kind of active way. 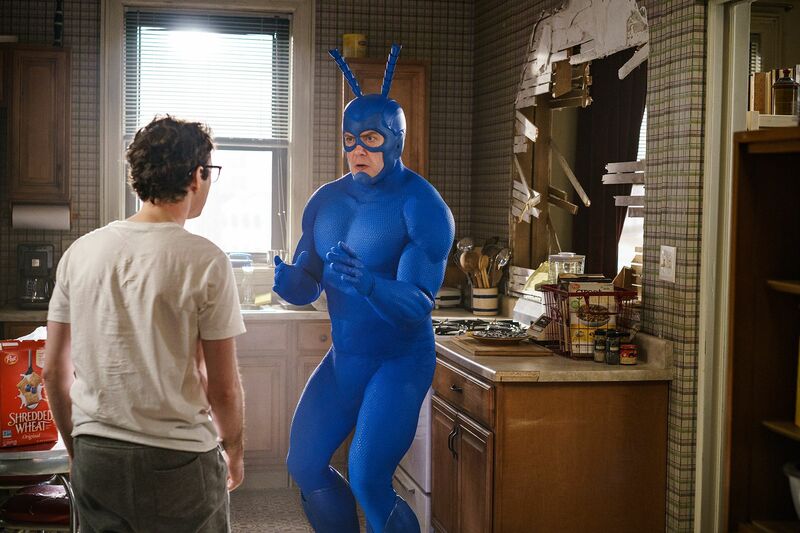 This version of The Tick as we kind of found in the first season is, he can learn a little bit. He’s sort of learned some things from his course of action in the first season and has had evolution, learned small things, baby steps for him. But in the history of The Tick, it’s the first time we’ve really kind of taken our story seriously and done our real building of the relationship between Tick and Arthur, but also the first time that The Tick has a kind of an arc and part of that arc, as we established in the first season, is “Who am I and where do I come from?” And we follow that up moving into the second season, with some … to tease, with some really, really cool developments that you get if you watch the second season in full. The first season of a show is often figuring out the way the show can be made, the infrastructure, how many effects can we do, all of that kind of stuff, and it’s a learning curve as you’re going. With the second season, you now know what can be accomplished and I’m curious how that impacted the writing process and what you thought about doing in the second season. EDLUND: I think we discovered in the first season that we wanted to be a little bit more elegant and economical in what kind of ground we wanted to cover, so I think we found our comfortable place as far as like, yeah … The second season, production is actually falling into a really nice rhythm. The crew’s beautiful, our engineering in terms of our thoughts about how to integrate what sets we wanted to build and how we wanted to kind of flesh out the area of the world we wanted to chronicle the season. That’s worked out beautifully, actually. We’re really building this sort of world of this kind of … our version of our superhero homeland security place and that’s been really, really fun. That’s been like a production design and writing and kind of conceptualization that’s a major undertaking. It’s one of those things that can either kind of take off and really make your, it can kind of either sing or not, and I think we have that kind of singing, which is really great. It’s fun. EDLUND: The brochures are our best part. The brochures are pretty great, and were you thinking about merchandising when all this was designed? ‘Cause there’s a whole bunch of merchandising that could be available for AEGIS. EDLUND: Well, the AEGIS gift shop is like, they’ve got the biggest gifts. Like FBI does not gift shop like that, do they? Maybe they do. I don’t know. Yeah, sure. I think that what I’m happy about is that in the previous live action, which I really enjoyed and it was a different thing, but we never really had the time to create the culture of the world, things like AEGIS or Brown Tingle Cola, or just small things that kind of exist in the world that sort of build out the world. The second season we’ve done more of that. We’ve been able to bring in superheroes, because The Terror had a no superhero zone in the city and he’s been vanquished, so ultimately we’re starting to build up a bestiary and that’s gonna be fun, ’cause then we’ll get a bigger and bigger armada of interesting critters to show the audience. I wanted to ask, Terror basically goes to jail. EDLUND: He goes to Popsicle jail. He gets frozen. How does that affect Lint? Is she one of the leading baddies in this season? Or is it one of these things where possibly everyone has to come together to fight off something else? EDLUND: I’d say it’s nice and unexpected. Even The Terror actually turned out last season to be more of a … I mean, yes, he was a villain. He was very much a villain. But a lot of our characters are more just people trying to get by. And so Miss Lint, she’s basically a career person, career woman trying to get by, and she keeps going with that. So, in the new season, she’s trying to take the reigns of control and that sort of starts her off. I’d say that it’s … I’m trying to make this into a good soundbite. But it’s like this season, it’s less about one big bad and it’s got a nice sort of, I think, exploratory, rhythmic investigation of the world. Miss Lint, she makes trouble. And she also tries to get ahead and that turns into a lot of fun for our guys and fun for the audience. Miss Lint is a member of the family in a twisted way, so she’ll come up against us, but ultimately this is a story that’s kind of building a fun raft of characters that we just start to watch try to work out their crap. 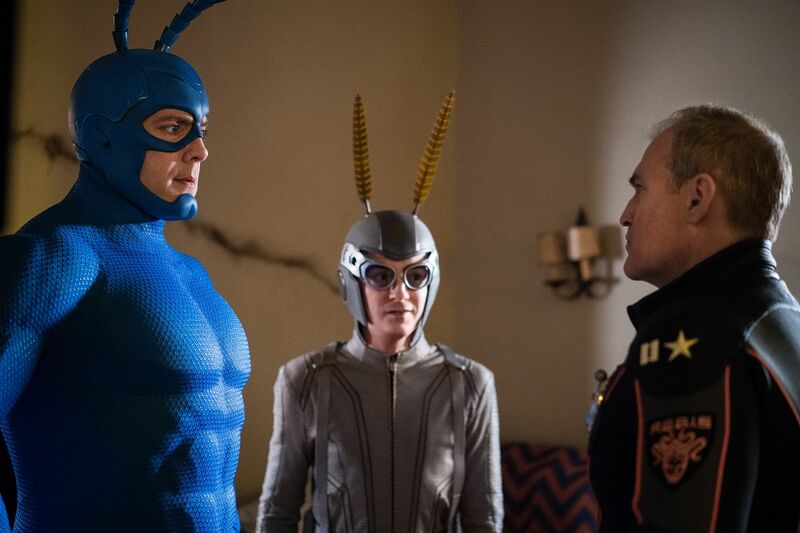 I think like last season was about Arthur and The Tick coming up against The Terror and it was very sort of binary in this relationship to a villain in a kind of classic hero’s journey, build up the character, sort of against a single opposition kind of world. This one is more omnivorous. AEGIS comes bearing gifts and also laden with curses, and Miss Lint as always is trying to do evil and just steal as much as possible, but her intentions get twisted up and become sort of, turn into unexpected outcomes and we get to meet a lot of fun new heroes. I think we’ve got some really cool world expansion that people are gonna really be excited by.